Should Worship be Emotionally Expressive? Several weeks ago, I wrote a post called, ‘Should worship be physically expressive?’ It seemed to be helpful to some folks and was posted on several other sites (Rooted Network, Church Leaders). I thought it may be helpful to explore emotional expressiveness in worship, drawing on some of my research reading from earlier this year. I. Why do Emotions Matter? Contemporary worship is framed within a paradigm of encounter: we gather to sing and to meet with God. In fact, many scholars have remarked that in charismatic worship, singing is the place of encounter. It ought to be noted, however, that Christian worship has in one sense always been about an encounter, which historically was God meeting us in the bread and wine. The paradigm of encounter is significant because encounter involves emotion. What we mean in modern worship when we say that we ‘encountered God’ is that we were able to truly express our hearts to Him and that we are somehow in a mysterious way able to experience His presence. Both expression and experience have emotional qualities to them. This is not to see that they are solely emotional; only that they include and perhaps even rely upon emotion in order to occur. Thus a worship paradigm of encounter places emotion as a key player in the process. The question, then, is not so much whether or not worship ought to be emotionally expressive, but rather, what sort of emotional expression is appropriate—and, furthermore, who decides? First, we briefly explore what emotions are, beginning with what emotions are not. Emotions are not moods. Moods have no object; they are undirected feelings. Emotions are aimed at something. That’s why Bob Roberts (Baylor) argues that emotion is a kind of perception—it is a way of seeing the world. Based on a concern, we construe a situation in a particular way. If you had hoped to go on a picnic (your ‘concern’), you will see the rain (your ‘construal’) as a negative thing. But if you were nervous (your ‘concern’) about wildfires in the summer, you will see the rain (your ‘construal’) as a blessing. The emotion—either of disappointment in the first example, or of relief in the second—is a clue to your construal and, deeper down, to your grounding or orienting concern. So emotions are ‘interpretative perceptions’; they help make sense of a situation. However, emotions also have a kind of ‘perceptual immediacy’—they happen some times before we realize why, pre-reflectively. Emotions are not just a way of seeing; they are a reason for doing. They are not simply perceptional; they are motivational. Because they are concern-based, they are affected by what the subject cares about and can move the subject to ‘action in a way that is suggested by the concern that is basic to the emotion’ and ‘along the particular way of construing the situation that the emotion involves’ (Roberts). Much of the vocal and bodily gesture features of an emotion are found in music. For example, when you’re sad, you tend to walk slowly, perhaps slumped low; you speak in low tones, managing not as many words per minute. In a similar way, music that we call ‘sad’ tends to have melodies on the lower register, have fewer beats per minute, and includes more minor key motifs to reflect the harmonic dissonance or tension. By mimicking our vocal and bodily gestures of emotion, music provokes the brain to trigger the same sorts of responses. This phenomenon of ‘proprioceptive feedback’ is so strong, that we can actually generate a mood (or something like it) by going through the motions of an emotion. If you’re sad, take a brisk walk, speak in bright tones and upper registers—or better yet, sing a happy song and then you won’t feel so bad (cue: Maria and the Sound of Music). Finally, music has the power to ‘educate’ our emotions by adding to the range of emotions in our repertoire of expression. Because of music’s power to evoke emotion, it can introduce us to new emotions, things we may have never felt or expressed before. Music can also articulate emotions we have not yet been able to express in words. So far, so good. But the trick with emotions in worship is that we are neither experiencing nor expressing in isolation; worship takes place in a communal setting. Because of that, we need to use a sociological lens and explore two facets of emotion: ‘feeling rules’, and collective behavior. According to Hochschild (UC, Berkeley), ‘feeling rules’ are emotional standards that pressure people to display the ‘situationally “correct” emotion (what she calls “surface acting”), motivate people to try to ‘experience appropriate emotions’, and that motivate people to try to ‘suppress inappropriate’ emotions’ (what she calls ‘deep acting’). Collective behavior is like a ‘feedback loop’. Performers use the above resources of music and language to evoke a response from the congregation. The response ‘increases in intensity and quality of the performer’s actions, which in turn evoke a greater congregational response’. This circular reaction is a hallmark of ‘collective behavior’, and involves an ‘oscillating movement toward higher levels of intensity and participation’. Collective behavior also requires the transfer of control. The key dynamic which makes all collective behaviors possible is the individual’s willingness to ‘transfer control’ to the group. The emotional service becomes a ‘joint creation’ produced by the performer and the congregation. 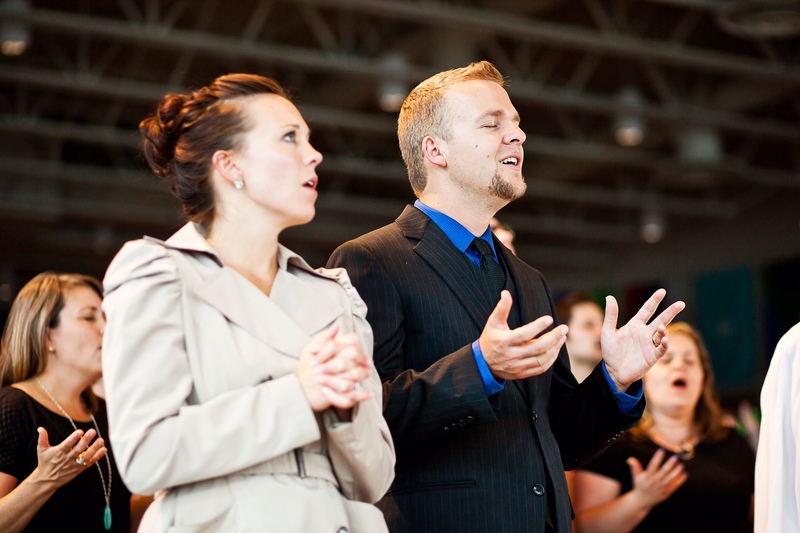 Is there a way to determine whether or not particular emotions in worship are appropriate? Theologically speaking, emotions are ‘rightly ordered’ when they are appropriately directed toward the right objects. As Augustine would say, love ‘first things’ first. Of course, this was actually what Jesus said when asked to name the greatest commandment—and He was re-framing the Torah: ‘Love the Lord your God with all your heart, with all your soul, with all your mind, and with all your strength.’ And the second thing is just like it: love your neighbor as yourself. Our deepest affection—emotional and otherwise—must be directed toward God Himself. Emotions cannot be an end in themselves. Feeling hopeful is not the same as having the virtue or character quality of hope. Roberts develops an argument, however, that emotions can be instrumental in the cultivation of a virtue. But we must not mistake them for a virtue. Still, emotions are better than moods (moods have no object), and emotions, when tested in the world, can grow into virtues. Music has the power to evoke emotion; lyrics have the potential to direct them. Emotions in worship must be aimed chiefly at the Triune God, and secondarily at our neighbor. Worship can educate our emotions. One of the questions we may ask about our services (if you’re the pastor or worship leader), is how broad the emotional spectrum is. Are the songs predominantly upbeat? Are they mostly reflective? Do you tend to stay in one band of emotions instead of awakening the congregation to become aware of different emotions? Worship has the power to give voice to our deepest sorrows and truest joys– and everything in between. Let’s harness it’s power as best we can. Be careful of ‘emotional expectations’. It is tempting to call someone else’s worship service ‘dead’ because it did not conform to the ‘feeling rules’ that we are comfortable with. This is often a mistake, however. Similarly, when you find yourself in a service where everyone seems to be meeting with God, but you’re not, maybe what’s really going on is simply that you aren’t feeling or displaying the same feelings as the majority of the people in the service were. That need not mean that God was not present to you or that you weren’t present to Him. In short, be careful of our emotional expectations of others, and of ourselves. Thanks for the concise yet encompassing thoughts, Glenn. We must understand emotions place in worship, as well as our thoughts, actions, etc. They all have their place, and to understand worship as solely one or the other offers a splintered understanding of self that flirts with gnosticism. Good stuff, Glenn. This is a great topic to pursue, because I hear comments on the emotion–or lack thereof–in worship services of different contexts. One point of clarification: under the 5th take-away, you wrote, “That need not mean that God was not present to Him or that you weren’t present to Him.” Is there a typo in this sentence? Or, how would God not be present to Him(self)?